How to set up a desktop development target to contribute to Nemo apps | Comments, Code and Qt. Why a desktop development target? As described on the Nemo wiki page and also in Vesku's blog post, you can create your own applications for Nemo using the Harmattan target readily available in QtSDK. But the Nemo apps have some extra dependencies that you need to fulfill and adding them to the Harmattan target requires some additional work. Also developing directly for the desktop is just easier. So let's get started. First you obviously need Qt. You want to use Qt 4.8.1 (or later 4.x). It probably doesn't matter how you install it, but I used the Qt SDK in which case I needed to add that Qt version to my PATH. Qt SDK can be fetched from http://qt.nokia.com/downloads/sdk-linux-x11-32bit-cpp-offline. Use the latest snapshot of Qt Mobility from Git. The latest released and packaged version (version 1.2.0) won't work. For QmlContacts you need the contacts and the versit modules. ./configure -prefix /usr -modules "contacts versit"
You need the Qt Components from the Nemo Mobile repository. If you already haven't, you also need to install the OpenGL development package for X11 as Qt Components requires that. Then you want to configure Qt Components to build the MeeGo components. You will see a warning while doing so, but that's ok. And when you compile it with make, at least I got a compilation error while compiling the tests. But that's ok, we don't need them. Qt Components needs a theme to work with. We'll use Nemo's default theme which is a fork of the MeeGo Harmattan theme. The install instructions below are taken from Sage's blog post, but for the sake of completeness, I'll copy them here as well [I used a Git URL that points to Nemo's GitHub repo]. Nemo QML apps have a set of shared C++ plugins. The project currently depends on the qrencode library (could be more dependencies in the future) for QR code reading, so we need to install it as well. We've finally installed all the dependencies and now it's time to install the Nemo app that we want to develop. 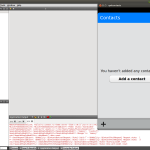 In this case I am using the QmlContacts application. The QmlContacts application provides its own API (org.nemomobile.contacts) and plugin, so we need to do a install before we run the application for the first time (and of course after we make changes to the QmlContacts plugin). It's easiest to do this from the command line, but after the initial install, we can build and launch the app from Qt Creator as well. 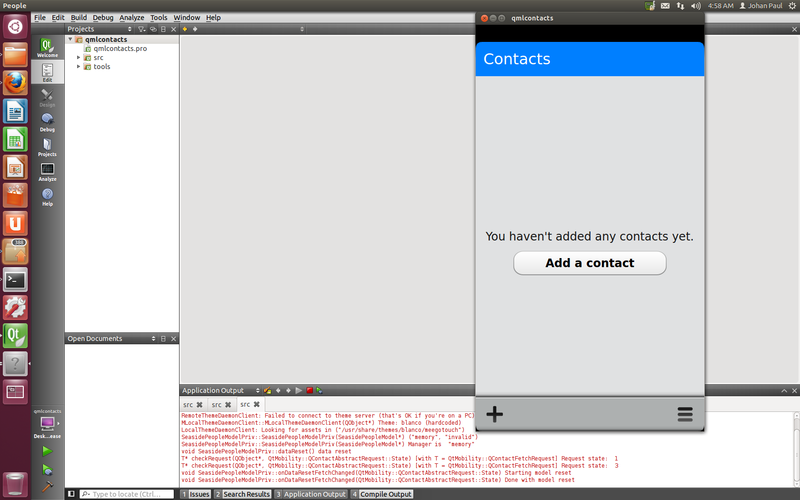 And now you can open the qmlcontacts project in Qt Creator, do a rebuild and run it! Happy hacking! Appreciate the post. Small request though if you feel like extending the tutorial ? How about small modification and installing to non-default destination so that keep qt stuff out of possible os versions of the libs ? Not very likely scenario but benefit would also be easier uninstallation/upgrade/version testing process. Well, yes I see your point. But as far as I recall, the only component installed into the system dirs is Qt Mobility (as I specify the /usr as prefix). You could install that also under your Qt installation in your $HOME (sorry, can’t say the exact dir of the bat :)). The other components are installed already under your Qt installation dir. Except, of course, for the theme. That path is (for now at least) hard coded. Sorry, don’t know why. But it’s probably related to the fact that I did not install any MeeGo Touch Framework components in which case the theme would be (possibly) detected where ever MTF is installed. Yep, thanks for pointing this out! Fixed.